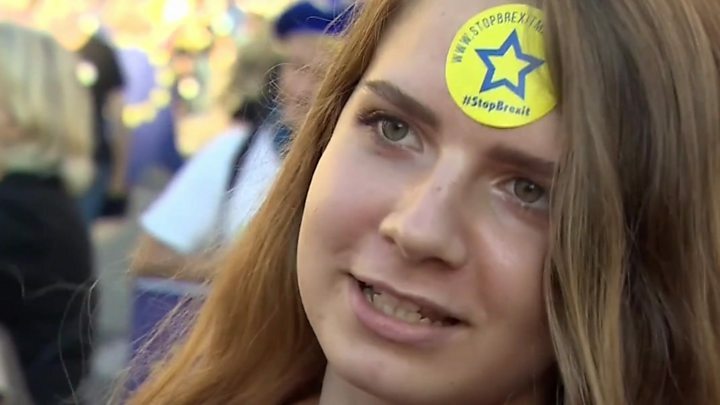 Young voters led the People's Vote march to London's Parliament Square, which supporters say attracted approximately 700,000 protesters. It also had support from a number of MPs who want a fresh vote. 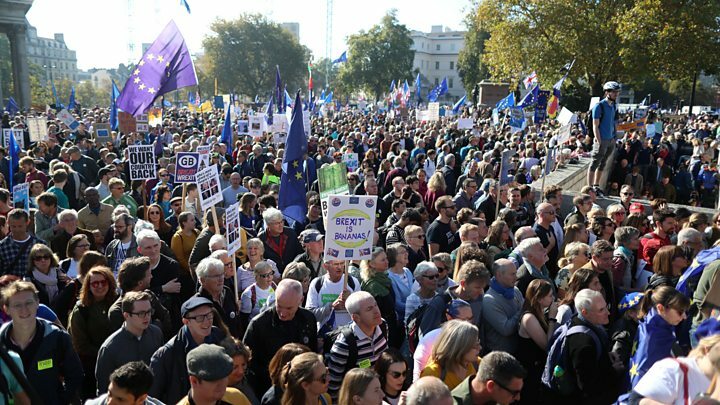 The People's Vote campaign said stewards on the route estimated 700,000 were taking part. The Metropolitan Police said it was not able to estimate the size of the crowd. 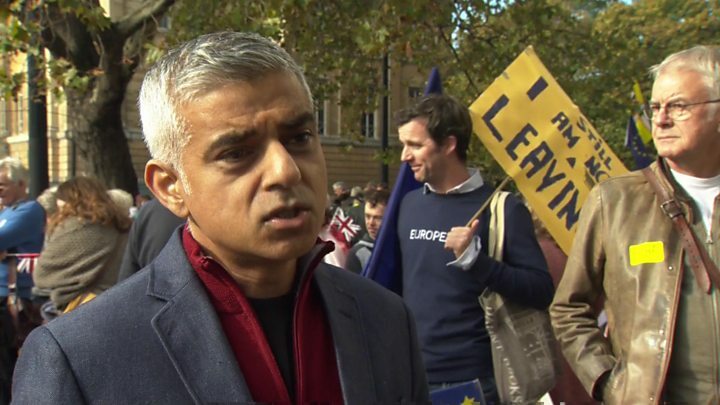 Mayor of London Sadiq Khan - who started the march - was among those who addressed Parliament Square, along with representatives from the main political parties. Celebrity speakers included Steve Coogan, Delia Smith and Deborah Meaden. London Mayor Mr Khan told the crowd: "What's really important is that those that say that a public vote is undemocratic, is unpatriotic, realise that in fact, the exact opposite is the truth. "What could be more democratic, what could be more British, than trusting the judgement of the British people." How will Parliament vote on a final deal? The march was held at the same time as a pro-Brexit rally in Harrogate, organised by the group Leave Means Leave and led by former UKIP leader Nigel Farage. Mr Farage said: "The evidence suggests about a third of those that voted remain now say we're democrats and think the government should simply get on with it. "And that's our message - get on with it, fulfil your promises to us, you said if we voted to leave it would happen, it needs to." People gathered on Park Lane for hours before the march. Many held home-made signs and banners with slogans like "the wrexiteers", "Brexit stole my future" and "Even Baldrick had a plan". As the crowds began to form, the sheer scale of the protest became clear. Thousands of people stretched filled the street, some were singing, others were playing instruments, while many plastic whistles blared out. There were lots of young families there, some with children wrapped in EU flags. Many told me they'd gone because they were worried about their families' future. Some people marched in groups - there were NHS staff, political parties, members of the LGBT community and dog owners. Many took the opportunity to dress up their pets for the protest. The start of the march was delayed due to the number of people there. It was a good natured and friendly march through some of London's most famous streets before the hundreds of thousands of people arrived at Parliament Square. By that stage the march was so large that not everyone could fit in the square and demonstrators spilled out onto nearby streets. The marchers are hoping people power will persuade the British government to hold a referendum on the final Brexit deal. They will have to wait and see if the government was listening. Labour's Lord Adonis, a campaigner for People's Vote - which wants a referendum on the outcome of the negotiations with the EU - said: "Brexit's becoming a dog's dinner. "This week's fresh chaos and confusion over Brexit negotiations has exposed how even the best deal now available will be a bad one for Britain." Richard Tice, founder of Leave Means Leave and former co-chair of Leave.EU, told BBC Breakfast: "The idea that you should have a second referendum would be incredibly damaging - most of all to the trust in democracy from people up and down this country." Some 150 coach loads of people from across the UK - including as far away from London as Orkney - travelled to the March for the Future, which started in Park Lane. TV chef Delia Smith told the crowds that Brexit was "the most important issue in our lifetime", adding: "My message to MPs is please sort this out. Let the people you serve have their say." Lord of the Rings star Andy Serkis attended with his wife Lorraine Ashbourne and 14-year-old son Louis. "The will of the people is now, it's people expressing their points of view in a more informed state," he said. And First Minister of Scotland Nicola Sturgeon sent a message of support to the rally, saying the SNP would support a vote that would give the option of staying in the EU. #PeoplesVoteMarch was trending on Twitter on Saturday, with lots of young people - some of those who were not eligible to vote in the 2016 referendum - heading on the march. Emily Longman, 20, one of the students leading the march behind a People's Vote banner, was four months too young to vote in the 2016 referendum. She studies Spanish and is due to study abroad next year, but said "no-one knows what will happen with Erasmus funding". Aleta Doyle, 46, from Peterborough, who attended with her 12-year-old son Leo, said she was marching "for my children's future and European unity". And Leo Buckley, 16, from Hampshire, said: "Young people stand to lose the most. I'm going to be poorer and not have the same career opportunities." At the other end of the age spectrum, Joe Trickey from Croydon celebrated his 83rd birthday at the march. He said: "I believe very strongly in the EU as a place of peace and strength." Dr Mike Galsworthy, from NHS Against Brexit, told BBC News: "Whether you voted leave, or whether you voted remain - when a contract comes back, you do have the right to read the small print and say actually 'no, no. no, this isn't what we want to be signing up for'." Campaign supporter Alastair Campbell, former Downing Street director of communications, said: "The Brexit that was promised, and the Brexit that was campaigned successfully for, doesn't exist." He added: "I don't think you can re-run the referendum. I think we have to accept that we lost that debate. I think the question has to be on the nature of the deal." Saturday's event followed a march in London in June, on the second anniversary of the Brexit vote. Brexit: How will Parliament vote on a final deal?